This exceptional book covers the history of the Japanese Navy's famous 343 Kokutai (Air Group), which fought 15 major air battles from March to August 1945. Henry Sakaida and Koji Takaki, authors of several other books on Japanese combat aviation, have not only written the definitive history of the 343 Kokutai but have also reached a standard of excellence rarely achieved in books on Japan's WWII military operations. The two authors performed thorough research of written sources and conducted numerous personal interviews with veterans. By methodically examining and comparing Japanese and American sources, the authors uncovered a number of interesting stories and pieced together what happened during the 343 Kokutai's battles. After Japan's defeat in the Battle of Leyte Gulf in October 1944, Capt. Minoru Genda, veteran pilot with over 3,000 flight hours and strategist of Japan's attack on Pearl Harbor, proposed the formation of an elite fighter unit to regain control of the air. Even though many naval leaders supported kamikaze suicide attacks as the primary strategy to stop the advancing American fleet, Capt. Genda received approval to create a new fighter unit led by the best veteran pilots. Training led by Capt. Genda began in January 1945 at Matsuyama Airfield, and the base of operations later moved to Kanoya (April 4), Kokubu (April 17), and Omura (April 25) in Kyushu. The 343 Kokutai pilots flew single-engined Kawanishi N1K2-J Shiden-Kai ("violet lightning-improved" in Japanese) fighters, which performed impressively in battle in comparison to other fighters such as the Zero. The book does not include any total summary statistics of battle results of the 343 Kokutai, probably due to significant differences between Japanese and American pilot claims and actual losses during major battles. However, the book does provide some statistics. The Introduction states that 88 pilots from the 343 Kokutai died in battle (Appendix lists 91 names of pilots killed in action), and many individual chapters on major battles provide figures on planes downed and casualties for each side. Capt. Genda's unit of elite fighters had a close relationship with kamikaze operations during the Battle of Okinawa. 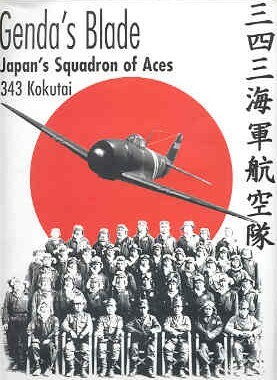 The 343 Kokutai had the task of trying to clear the way for kamikaze planes as they flew from southern Kyushu to Okinawa during the Kikusui operations in which large numbers of suicide planes sortied in ten separate attacks from April 6 to June 22, 1945. The Shiden-Kai pilots fought several fierce battles with American fighters over Amami Oshima and Kikaigashima. When American planes bombed Kyushu airfields to try to stop kamikaze attacks in April and May 1945, the 343 Kokutai at times engaged enemy aircraft although the Shiden-Kai was not intended for high-altitude interception of B-29 bombers. Even though this book has numerous detailed battle descriptions, Sakaida and Takaki have also included many fascinating personal stories. For example, there is a three-page piece on four American airmen who were shot down by Shiden-Kai fighters and held as POWs. When a crowd surrounded one downed pilot and someone shouted to kill him, the wife of a local doctor pushed through the crowd and screamed for them to stop as she considered the wounded pilot to be blameless since he was just fighting for his own country like the sons of some of the villagers threatening him. Dozens of wartime photos, both of Japanese and American pilots and planes, fill this oversized book. The book's Appendix includes helpful aids such as a listing of Japanese Naval Air Force ranks and a glossary of US and Japanese military terminology. Sakaida and Takaki worked over 20 years on the research and interviews included in this outstanding history. Although the book's numerous details and narrow subject matter may not interest everyone, its personal stories and insights make it appeal to a broader audience than just aviation enthusiasts, historians, and WWII veterans.